Thank you everyone for your feedback! I’ve narrowed the choices down to just two: the Zinnia Shower Curtain and the Graphic Fabric Shower Curtain. I’ve made some mock-ups in Photoshop, and you can view larger versions of everything on flickr. Oh, and it may be hard to tell – that’s dark brown (not black) in the first few options. Previous Post It's Curtains for You (Shower)! definitely 6. nice and clean. I love 8, but 6 is nice, too. It makes me want to redo our bathroom. Too bad it’s a rental! I love all the even-# ones, especially 4, 8 and 2. You have such a knack for design!! 4 or 6 but leaning towards 6. 4 is really good though. I’ll go for #4 ! Definitely. I’m going to break the trend and say #3. My second choice is #6. But I just really love that purple wall color – what about #5 or #6 with the wall color from 3 & 4? #’s 2 and 8 are my favs. Love the green walls. Hmm, now #6 is looking pretty good too. Wow, that’s going to be a tough decision there! #5. Why? Beacause it’s the warmest and lightest and brightest one. I like my bathroom to be a place that makes me happy in the morning when I am tired and grumpy :) #1 is pretty cool though, with the black. Ok, one of those two. definitely 2 or 6.. I think a less feminine shower curtain would be a nice gesture for your lovah.. also it looks fantastic with the dark brown or white vanity. Whichever.. sophisticated or bright! Both look great… personally I prefer the dark brown. I love 2 and 6 — I’m having a really difficult time deciding between the two. The white feels airier, but white wood in the bathroom is so commonplace that the dark brown would be a refreshing choice. Is the green wall color based on a specifc paint, or do you plan to match a paint to what you created here? I ask because I’m looking to do a green in our spare bedroom that would be a wee bit darker than this. #6…or 8 (if you can’t beat ’em join ’em, right?). Love the green wall. The zinnias on the white background work with the toilet instead of fighting for all the attention. And the white wood work is crisp and clean! Thank you so much for showing your process and progress. Makes me anxious to get into a new home. no 6 FOR SURE. the white cabinet makes it al bright and fresh along with the light green walls. i vote for 6 and if not, then 4! actually, i think that the curtain in the even number photos just works better with your blue toilet so maybe hang it up and see what you think. I like how #4 looks in the photo but I think the lighter shades would “feel” better if you’re standing in the room. So’d Im going with #6. I like #8. It makes the toilet seem deliberate. I have a maroon and pink tile bathroom that for generations has been painted light pink, which is totally wrong, IMO. We painted it chocolate brown with a brown shower curtain, towels, rug, etc. Go bold and deliberate! #2, downplays the toilet, while fitting it into a nice modern scheme. Interesting how #2 has a larger fan club on Flickr than it does here. That’s my first choice. Since you didn’t mention replacing your brown-based tiles I think the dark brown is the way to go. Does this mean you are going to stain the existing pieces or paint them dark brown? I think a dark, wenge-like stain would look incredible, while still showing off the wood grain. Number 4 is definitely the winner. The blue wall makes the room look put together and the brown stain makes the room look more sophisticated that the white. I have a really random question but I hope you’ll answer it. I just saw a flickr slideshow of your old apartment and I flipped at the sight of the towels in your bathroom: “Good, Clean, Fun” Where can I get my hands on those?! (pardon the pun) Can you help? De-lurking to say I love number 6. I feel like that one is the most cohesive of the bunch. Six for the win! I’ve been checking out your blog lately (obviously) and it is really inspiring, seriously. I think number 6 or 8 are great!!! I love the idea of making mock ups in Photoshop! I should do that for my bathroom – ours is shaped just like yours, except I think its more narrow as I dont even know how I could take a photo of both the sink and the toilet in there – even with a wide angle. Have fun choosing! My first choices were 2 or 5 but when I saw so many liked 6, I decided I liked that to. I love all your mock-ups – I need to figure out how to do that! 2 or 6! Green always looks fresh in a bathroom! While I love #6, I think #2 is the front-runner. lsaspacey made a great point about the tiles…and if they’re staying the #2 still maintains a fresh quality while tying all the elements of the room together creating a more cohesive look. And I am happy to see that the Graphic Fabric is a final contender as that was my favorite! You’re doing a bang up job on the house! Keep up the great work! #2!!! Definately! The wall color is great with the curtain and the dark wood picks up on the dark brown in the curtain. AND the turquoise Toilet looks great with paint and curtain. FAB! #6 is the best way to go. ok, not 1. not 2. eek, i just want to make the toilet white! i vote for 4, or 6, or 8. i like in 8 how you did the mirror in blue. the toilet is really a force to be reckened with isn’t it? how much is a new toilet?? i’m worried that the zinnia curtain is going to look too yellowy when you get it. i like the other one b/c of the bright whiteness. it seems more you. one more thing. i feel weird about the light blue accessories. the tissue box looks odd on the bright blue toilet. def. 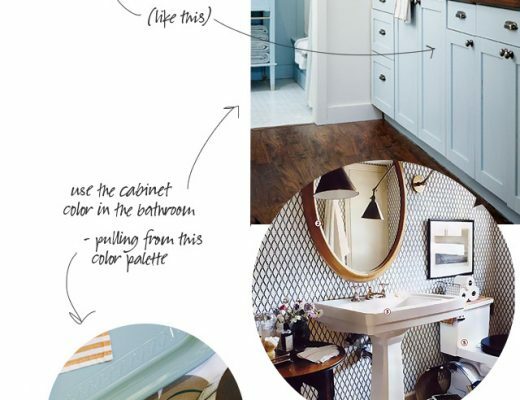 # 4: the brown cabinet and the blue walls de-emphasize the turquoise toilet. Also: are those cupcakes on the wall? I like 8 the most, but 4 is nice too. I think that the white blends in too much with the walls. Also, much prefer shower curtain on right. I like 4. The dark cabinet with the dark in the curtain is nice and the colour on the walls makes the toilet stand out less. I’m liking 4 or 6. To me, you need to pick an odd. The even number mock-ups don’t tie the countertop in at all. The odd numbers looked at those it was meant like that all along. #2 or #6 – ALL of your mockups look fantastic! Please – for all that is good and holy – do NOT paint the vanity blue! Please! Just resist it! There is absolutely no need to be that matchy-matchy. It will also cause your friends to question your sanity if you embrace the turquoise to that degree. I’m leaning towards 5 & 6 just because I like bright white cabinetry in my bathrooms. I would choose #5 if the wall color was warmer, but all in all I think #6 is the winner. Hi. I like 2 or 6 too. Funny because I thought I liked the other shower curtain. 4 definitely. Contemporary and relaxing, makes best use of the toilet and has the nicest shower curtain. You are also a photoshop genius. Do you use some sort of program? 5! I think the white goes best with the toilet & I like it paired with the warmer tones in that shower curtain. #6 looks best, imho! Good luck and can’t wait to see the results. I love your library too! I like 4– it seems more modern and clean. 6 seems a little country to me. I like #3, but what really matters is what you like right? So many choices. I see your dilemma here. 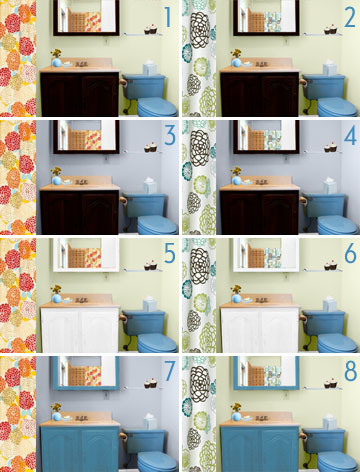 I like 5; the contrast of warm shower curtain –> neutral white cabinet –> cool-colored toilet pleases me. WOW!! I’m still not 100% sure, but everyone has helped me narrow it down. I’ll post again with the version I choose. * Alissa: I don’t have a specific paint color in mind yet – that color was just what I came up with in Photoshop. * lsaspacey: I’ll be painting the wood, even if I go with the dark brown. The wood is in terrible condition and I think paint will best freshen it up. * Anon: The “Good, Clean, Fun” towels were from Target’s Swell line a few years ago. I should look for those again (I know they’re around here somewhere)! * Valerie: Yep, they’re cupcakes! I’ve been wanting them for a while now, and I figured they would be cute little storage in the bathroom. * Mary: I think I’ve seen some stuff that will paint over tiles too. I just don’t know if I want to put that much effort into what will (hopefully) be a temporary fix! * paola: Thanks. I just use Photoshop. I like #4 the best. The blue wall mellows the toilet color and the shower curtain with the dark vanity and mirror is very calming. I dig calming bathrooms. The best for long, relaxing baths. Lovely work all around though! it’s so neat that you did those mock-ups. such a talented girl…she caulks, she hammers, she makes pretty pictures. Oh Boy,,,,i totally think Number 2 is the winner. To me it comes across as fresh and sophisticated and modern without being too cute. The colors are serene and calming….kinda spa-like. GO FOR #7! Unfortunately, I have your bathroom. But we have the matching turquoise sink as a bonus (wll send pictures if you need some emotional support). The toilet will always be a crazy beacon of turquoise unless you tame it and balance out the room a bit. I bought the zinnia curtain, bathmats and towels to just take it over the top. But your more restained version works. i love #4…what a great idea and to photoshop and play with it like that…where have i been?? 2 and 4, I think those combinations really play down the sink color. Definitely #4. I like the dark brown cabinets best. I have a question about your mad Photoshop skillz when doing these renderings. I also use Photoshop when I’m considering a decorating change and generally do an okay job, except when I’m changing the color of something, especially walls. I can never manage it in a way that that looks realistic–my efforts are always at odds with the lighting of the picture or something, and it never looks natural. What I usually have tried is making a selection of the part I want to change and putting a color overlay it, then bringing down the opacity till I can see the details of the object through it–but doing that always changes the color till it’s not what I wanted. Your renderings look so nice and clean and realistic in comparison! What method do you use for coloring? I really like the white cupboard- so fresh!- would like to paint my kitchen cupboards but have been discouraged by contractors. Is there a certain paint and finish you would recommend? Did you sand and prime first? Tallulah Jean, I use the color replacement brush, then play around with the dodge and burn tools. Anne, we did sand and prime first, and used a semi-gloss finish. The glossier the paint, the more mistakes will show, so try to have a smooth surface to start with, and then paint in smooth even strokes. Good luck!